Photo Editing is Fun and that’s why I write a number of posts on such software in my blog. I recently came to know about TwistedBrush Open Studio, which has been around for a while but yet to be popular. I found this software quite versatile and is perfectly suited for professionals who need a Free photo editor with powerful features. Even for a beginner, this software is useful owing to an excellent quick tutorials that comes along with the software. 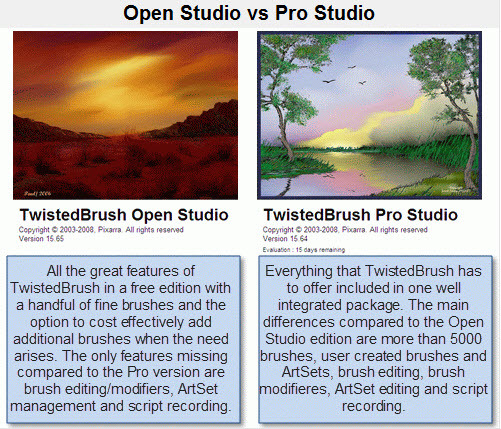 There is also a Pro version, TwistedBrush Pro Studio which is more powerful. That software normally costs $99 and as I posted on the forum, you can get a 70% discpunt on that software. The software [17.6 Mb] can be downloaded from the following link. Installation went on fast and clean and requires administrative rights to complete. 29.39 Mb of disk space is needed for the software installation. The software is not fully compatible with Windows Aero. While testing in Windows 7 Professional 64 bit, it worked perfectly but the color schemes got changed to that of Windows 7 Home Basic. Upon launching it opens the GUI along with the quick start guide. The quick start guide is greatly made for assisting even beginners with this advanced software. As described in their webpage, the software has a number of features. Layers and Transparency: TwistedBrush fully supports transparency and layers with all the standard layer mixing modes plus many unique mixing modes that can’t be found anywhere else. Masks: Extensive mask support for protecting and selecting parts of your work. Use the Magic Wand tool with the wide range of options for creating masks or use masking brushes to paint your masks. Cloning: With the cloning brushes included in TwistedBrush Pro Studio and available for TwistedBrush Open Studio you can do all the standard cloning actions for photo touchup or convert your photos into the look of paintings or drawings. Tracing Paper: A drawing guide that allows you to see another image below your current image. Great when used with cloning brushes or just for a guide for proportions and layout. Image Formats: In addition to the TwistedBrush specific file formage, TBR, all the leading industry standard image formats are supported including, JPEG, GIF, PNG, TIFF, TGA, PCX, PSD, BMP, PCD, WMF and EMF. Drawing Tablet Support: Experience expressive drawing and painting wth the drawing tablet support with high precision sampling and pressure sensitivity. 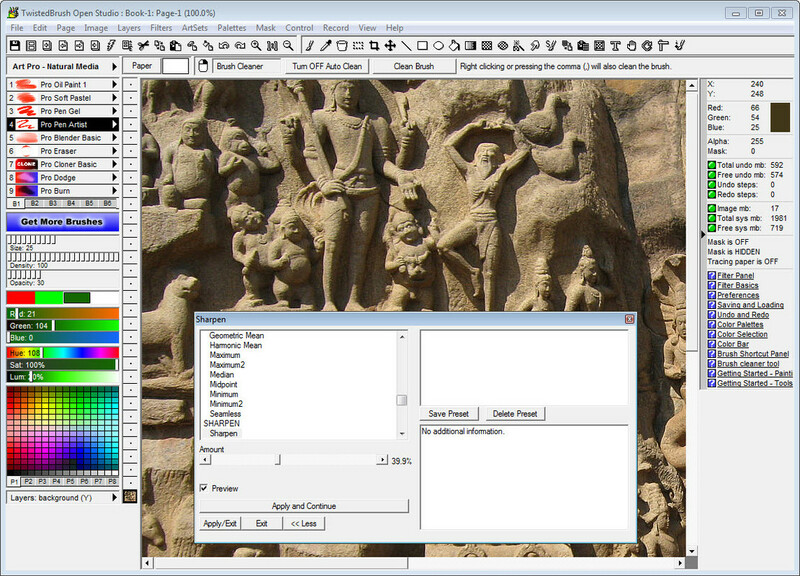 Powerful Brush Engine: Perhaps the most powerful image editing brush engine in existence anywhere. A single system with the flexibility and performance to mimic full natural media brushes, complex blending operations, very specialize procedural object painting such as single stroke trees and everything in between. Drawing Guides: With over 40 guides drawing precise images is easy. From simple grids and snap to grids to complex 3D perspectives, all drawing guides can be layered together with 8 guides active and any one time. 64 Bit Imaging: Internally a full 64 bits of color information is used per pixel to accomplish the incredible blending found in TwistedBrush. Image Processing Filters: Over 150 image processing filters give you the tools to manipulate your photos or other work. From all the common image processing filters to exceptional filters found no where else such as the Value Blur, Photo Pop, Photo Detailer or Outliner filters. Lua Scrpt Filters: The growing standard of GLUAS for using the Lua scripting language for writing image processing filters is included. 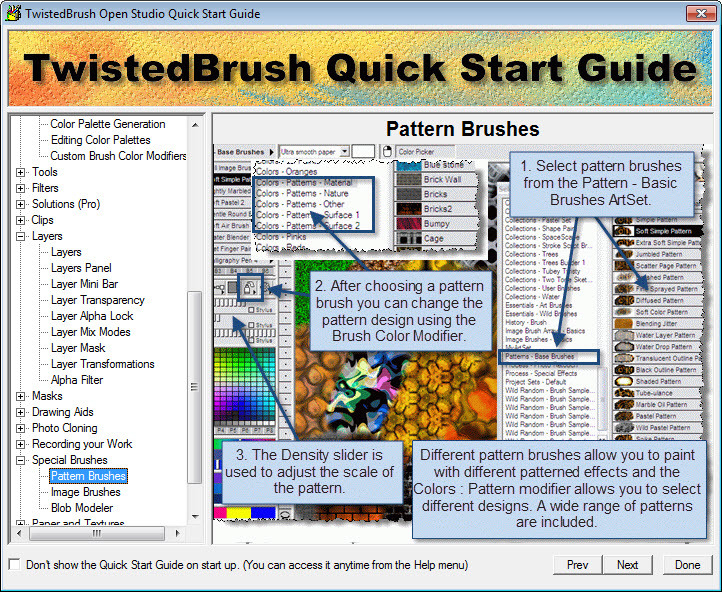 TwistedBrush extends the standard with additional methods for programmers to create even better filters for sharing with the TwistedBrush user base. Extensive Tool Set: In addition to some of the tools already listed a full range of tools are at your disposal including, Color Picker, Brush Cleaner, Selection, Crop, Move, Line, Rectangle, Ellipse, Paint Bucket, Gradients, Mask Rectangle, Mask Ellipse, Mask Wand, Image Warp, Script Brush, Copy tool, Paste tool, Unmask Grid Cell, Text, Pan, Rotate Brush, Drawing Guides and Adjust Brush tools. Color Palettes: A large array of color palettes, including, dynamic color palettes and mixing color palettes are included or create your own palettes from sampling an existing image or automatically creating ramps of colors. Clips:A fantastic productivity system that allows for easy storage and reuse of your clipped images and photo elements for use later. The software GUI is well planned. Playing around with the brushes in quick easy. All the features are well laid under the menus: File, Edit, Page, Image, Layers, Filters, ArtSets, Palettes, Mask, Control, Record, View and Help. I did a very basic testing on this software since its really time consuming to explore all the features and although I write regularly on photo editors, I am still not too comfortable writing about these. What I got to learn while using this software is that it is an idle alternative of any professional photo editor. There are some compatibility issue like what I mentioned before (The Aero issue) and also the software used a little high RAM all the time. I think it needs an update to sort these issues. It had been last updated (version 17.24) on January 16, 2011. The pro version is being updated more often and it has recently been upgraded to version 19. The software does not have a portable version but you can manually create one by copying the installation folder [C:Program Files (x86)PixarraTwistedBrush Open Studio] and running tbrush_open_studio.exe anytime for starting the application. 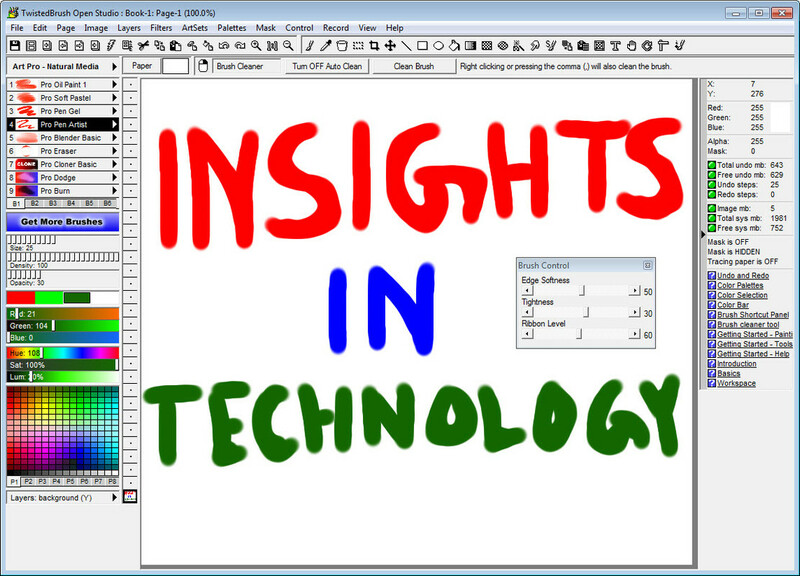 This entry was posted in Free, Graphics Management, Portable, Software, Windows. Have to admit, GUI is really a powerful software. Thank you for sharing.